On November 3, we held our annual Gator Boys Camp Car Show. 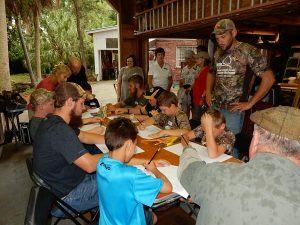 The Gator Wilderness Camp School is a private school for troubled boys from 10 to 15 years of age located in a remote part of Charlotte County, Florida. For the past several years, our club has held a members’ car show and picnic for the boys and their counselors. Many of the youths from the camp can benefit from positive contact with adults and we try to provide this with our cars as a catalyst. There were a number of activities planned for the day. The boys judged which British car they liked the best and the owner wass awarded the Peter Clark Memorial Trophy. The boys also participated in a car design contest where their drawings were judged for thoughtfulness, ingenuity and creativity. And this year one of our racing members, Bob Tone, gave a talk about racing and what is required if you want to do it. He showed the boys his racing gear including helmet, gloves, socks, etc. And, of course, there was a catered picnic lunch, followed with dessert provided by the club’s fantastic bakers. We had a great turnout with 22 British cars, over 40 members and 18 boys and their counselors. Thanks to Duane and Ellen Magnuson for again hosting this event at their home. Input from Bruce Skaggs. File photo.